Whether you need space to work or a location for an event, we can help. Our spaces are beautiful, flexible, and priced for your budget. Our rates are very competitive to fit your budget, and we provide special nonprofit and member rates. Community Gallery: Our a large, well-lit space with a maximum capacity of about 55 people standing and 35 sitting. It is suitable for community or business meetings, exhibits, parties, classes, film screenings, or other similar functions. Tables, tablecloths, chairs, projector with screen, and audio equipment are also available to rent with the space. 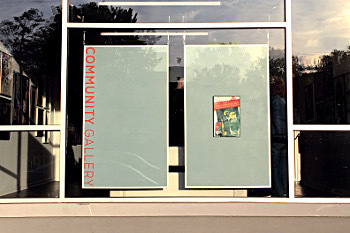 The Gallery can be rented during day or evening hours, and provides a private space for your event. artfullbean café: The café is our more intimate setting, appropriate for smaller meet ups, events, meetings, and gatherings. This warm and welcoming environment provides a casual environment for gatherings of up to 16 to 25 people. This space is available outside of regular café operating hours. Our delicious coffee is available for an extra fee. Studio/Office Space: We offer small private workspaces for artists or small business owners in our private, secure incubator space. For artists, the space is suitable for mediums not requiring spacial ventilation. The space comes with use of a printer/copier, wifi, and some office furniture, if desired. Listening Post: Our recording studio provides a fully soundproofed and private space for recording and podcasting. Desk and chair provided, bring your own sound equipment.